The thoracic outlet is the space between your collarbone (clavicle) and your first rib. This narrow passageway is crowded with blood vessels, muscles, and nerves. If the shoulder muscles in your chest are not strong enough to hold the collarbone in place, it can slip down and forward, putting pressure on the nerves and blood vessels that lie under it. 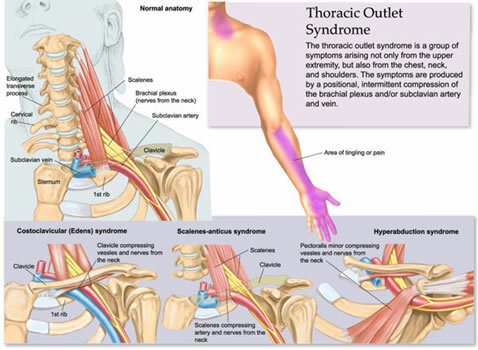 This causes a variety of symptoms which together are known as “thoracic outlet syndrome”. This condition may result from injury, disease, or a congenital problem, such as an abnormal first rib. It is more common in women than in men, and poor posture and obesity can aggravate the condition. Psychological changes are often seen in patients with thoracic outlet syndrome. It is not clear whether these changes are a cause or result of the syndrome. How will my doctor diagnose Thoracic Outlet Syndrome? Diagnosis of this condition is difficult and can be more complicated than diagnosis of some other more common shoulder conditions because there may be many symptoms to explain. Your doctor's evaluation will include an extensive medical history, physical examination, and diagnostic testing. 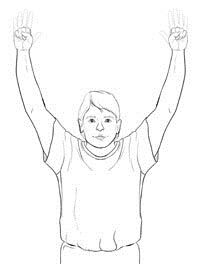 How do you treat Thoracic Outlet Syndrome? If nonsurgical treatment does not relieve your symptoms, your doctor may recommend surgery. Surgery for thoracic outlet syndrome may involve removing a portion of an abnormal first rib, releasing a muscle that joins the neck and chest, or sometimes both. Can I prevent Thoracic Outlet Syndrome from developing?